is used as an anticorrosion primer, interlayer and top coat for light and nonferrous metals, mostly for newly galvanized metal sheets but also for steel placed in interior and exterior. 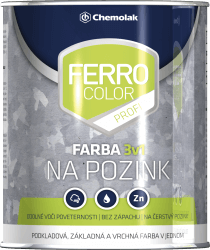 Ferro Color Profi is odorless, fast drying and has very good adhesiveness on surfaces treated by hot-dip galvanization. It is suitable as paint for roofs, gutters, gates, fences, handrails, steel construction and similar objects. Application is made in 2 layers on pretreated surface by brush, roller or spraying. It is diluted with water depending on the method of application.